You're facing numerous design choices when building an IPv6-enabled Service Provider network: SLAAC or DHCPv6 in multi-access subnets, local or centralized addressing pools, RADIUS integration, dual-stack or MPLS-based (6PE) deployment, and IPv6 VPN (6VPE) considerations. This 5-hour advanced technical webinar addresses all these design challenges and related router configurations, and describes comparative benefits and drawbacks of every decision you could make. We’ll also discuss Cisco IOS configurations for every single option described in the webinar, from core routers (P-routers) to provider edge (PE-) routers and customer (CPE) devices. You'll also get complete router configurations for over a dozen deployment scenarios. Dual-stack and MPLS-based core network. BGP is used to propagate access network routes between PE-routers. PPPoX deployments, with end-hosts or CPE devices establishing PPPoX sessions with the PE-routers. Multihomed business customers having provider-independent (PI) IPv6 address space and running BGP with the Service Provider network. The section also describes the intricate details you need to understand to deploy DHCPv6 prefix delegation on edge routers, including local IPv6 address pools, DHCPv6 relay and DHCPv6-RADIUS integration. 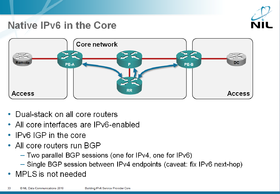 The Native IPv6 core design uses dual-stack approach: all core routers run IPv4 and IPv6. This section describes the consequences of this approach, including the need for AS-wide multiprotocol BGP. It covers numerous technical details, including IPv4/IPv6 BGP sessions, IPv6 BGP next-hop management and the choice of IGP (OSPFv2/v3 or multiprotocol IS-IS). An MPLS-enabled network core can use MPLS in combination with multiprotocol BGP to transport IPv6 across LSPs with IPv4 IGP/LDP or MPLS TE. This section describes the 6PE design and implementation guidelines and contains detailed router configuration for both PE-routers and multiprotocol route reflectors. Service providers planning to offer IPv6 VPN services might consider multiprotocol MPLS/VPN deployment; Cisco IOS allows you to configure IPv4 and IPv6 address families within a single VRF. 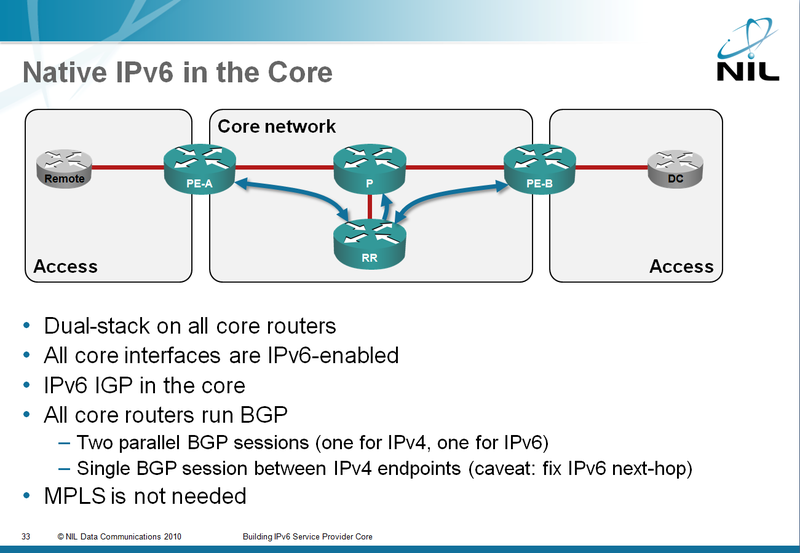 This section describes the basics of 6VPE (MPLS/VPN for IPv6), the changes made to VRF configuration in Cisco IOS and the additional address families that have to be configured within the BGP routing process. The webinar does not address product-specific details (for example, limitations of IPv6 on a specific hardware platform), low-end consumer CPE devices (Cisco routers are used as CPE devices) or details of specific access methods (for example, IPv6 over PPPoE over DSL). Several sets of complete router configurations for a six router lab are included with the materials you get when buying this webinar. The lab topology emulates a typical Service Provider network (with PE routers, P routers and a BGP route reflector) with various types of residential customer (WiFi hotspot, Carrier Ethernet using dynamic prefix allocations with DHCPv6, and PPPoE hosts and CPE devices), and an enterprise BGP customer (advertising its own IPv6 prefix via BGP). The presentation is ideal for advanced Service Provider and Enterprise engineers, from designers (who will probably focus on the benefits/drawbacks analysis of various transport options) to implementation engineers (who will enjoy the detailed configuration templates). Do not forget that large enterprise networks often resemble Service Provider networks: they use BGP to isolate the network core from access-layer mishaps and MPLS to transport data across the core. 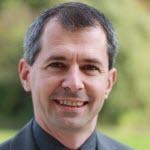 The Building Large IPv6 Service Provider Networks discusses advanced IPv6, BGP, MPLS and MPLS VPN concepts. You are expected to have basic understanding of IPv6 addressing and routing, BGP design and configuration and MPLS principles of operations.